In November, Voice of San Diego asked every public school district in the county for records involving substantiated instances of employee sexual misbehavior. Twenty districts claimed to have no records, one denied the request outright, three are still gathering records and three more were taken to court by current or former teachers. At the heart of the legal battle is an uncomfortable question: How much does the public get to know about the people educating their children? Three years later, school officials discovered the same teacher texting inappropriate messages to another student. These are just some of the messages contained in school records that the teacher didn’t want the public to see. He sued Vista Unified School District in court earlier this year to keep the records secret following Voice of San Diego’s public records request for them last November. The teacher – who was ultimately suspended for five days without pay and transferred to Vista Magnet Middle School, where he continues to teach, in 2016 – is still fighting to keep his identity secret. Superior Court Judge Ronald Frazier decided May 15 that the teacher’s name and other teacher names on misconduct records at Vista and San Marcos public schools should be released, and gave them 10 days to do so. It is not yet clear whether the decision will be appealed. In November, Voice of San Diego asked every public school district in the county for records involving substantiated instances of sexual misbehavior and misconduct for employees, agents or volunteers arising in the last 10 years. The records disclosed so far reveal dozens of instances of inappropriate behavior, including sexting, groping and sexual assault, that are newsworthy on their face. But the effort to obtain the records, and the players working to keep them secret has become its own story – one that’s still being written in the courts. All 43 school districts acknowledged the request and many produced records without issue. Twenty districts claimed to have no such records, one district denied the request outright, three districts are still gathering records and three other districts were taken to court by current or former teachers. Whether their lawsuits are funded by teacher unions remains unclear. At the heart of the legal battle is an uncomfortable question: How much does the public get to know about the people educating their children? Some school districts themselves have refused to produce public records. 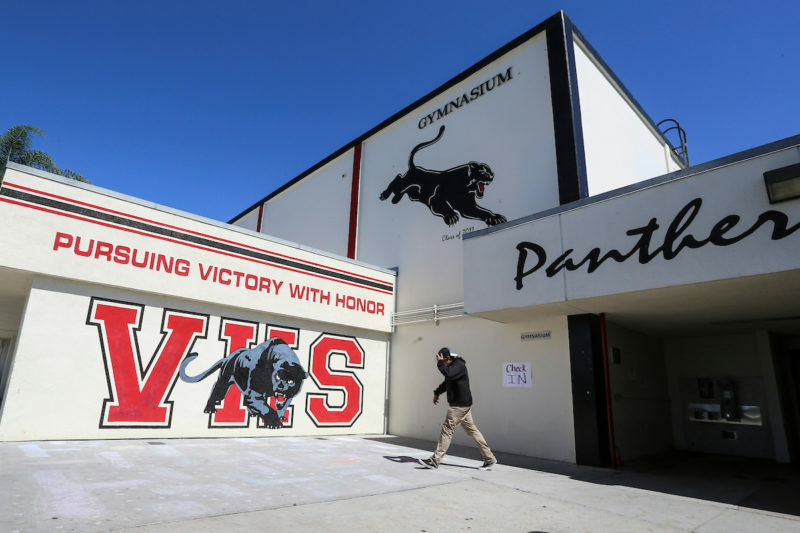 But in several instances – like in the case of the texting teacher at Vista High – the districts are willing to turn over the documents but have been blocked by the teachers involved. Those actions are known as reverse California Public Records Act cases, or reverse-CPRAs. The cases arose after school districts notified employees they planned to release complaints, investigation records and settlements involving the employee. The teachers went to court to get an injunction to stop the release of records. In another Vista Unified case, a former Roosevelt Middle School teacher is trying to stop the district from releasing records that show he exhibited stalker-like behavior with students. He asked students where they lived, showed up outside one student’s house to check on her and asked another student why she went straight instead of turning on her way home. In September 2013, Vista Unified gave the teacher $30,000 to resign. His name has not been released yet. VOSD has dug into the particulars of several employee sexual misconduct cases in the region’s public schools in recent months, revealing abuses of power as well as grooming by teachers trying to foster inappropriate relationships with students. Inappropriate behavior that school officials believe is not criminal is often confidentially documented in employee files, or not documented at all, which can help predators stay in the classroom for years. VOSD’s effort to gain access to the records means Frazier and possibly other judges will weigh at what point the public’s right to know how its government is operating trumps an employee’s right to privacy. Personnel records are largely exempt from disclosure under the California Public Records Act. School districts have long invoked that exemption to deny records requests. But a 1978 court case brought by the American Federation of State, County and Municipal Employees against the Regents of the University of California determined privacy rights can diminish in certain circumstances. The lawsuit was filed after a UC San Francisco employee facing discipline reported “many acts of alleged financial irregularities” by two superiors. Her claims spurred an investigation, and findings were summarized in an audit report. The employee and union asked for a copy of the audit report, and the university denied the request, claiming its release “would constitute an unwarranted invasion of personal privacy.” The court disagreed. The case provided a new legal standard for governments to use when weighing employee privacy rights against the public’s right to know about alleged wrongdoing. It also made clear cases resulting in even low-level reprimands, not just more severe suspension or dismissal charges, need to be made public. Two other cases are especially relevant to the current legal challenges over school misconduct records sought by VOSD. The Kern County Superior Court found the “complaint is substantial in nature and that there is reasonable cause to believe the complaint is well founded.” It ruled the records of the incident must be produced – including Brothers’ name. School attorneys sent memos to clients up and down the state following the decision, noting the disciplinary records described by the court included complaints, investigation records and memos related to the misconduct. In 2007, Brothers was convicted of killing his three children, estranged wife and mother-in-law in 2003. Several years later, in 2012, another records case sent shockwaves through the public school system. This time, a parent requested investigation records for Santa Monica High School teacher Ari Marken, who was found to have sexually harassed a student in 2008. He was reprimanded but allowed back in the classroom following a school investigation. Marken was notified by the school district that the investigation report and reprimand were going to be released to the parent, and Marken sought an injunction against the district in court, arguing the release would violate his rights to privacy. Marken appealed the decision and lost. Even though Marken is not a high-profile public official like a superintendent, “Marken occupies a position of trust and responsibility as a classroom teacher, and the public has a legitimate interest in knowing whether and how the District enforces its sexual harassment policy,” the appellate court found. The parent who requested the records tried to argue Marken could not file a reverse-CPRA action, but the appellate court said he’s wrong – setting the stage for the cases happening locally and elsewhere in the state. When local schools gathered records to release to VOSD’s public records request, they sent out “Marken notices.” The notice alerted the employee about the planned records release and gave them a deadline to sue the district for an injunction to prevent the records from becoming public. Some teachers in Vista, San Marcos and Oceanside went to court, but three Oceanside teachers dropped their cases when Voice of San Diego offered to forgo pursuing attorney fees against them if they abandoned the legal challenge. The Vista and San Marcos teachers didn’t take the offer. The standards laid out in earlier court cases only allow VOSD and the public at large to seek records that are both substantial, and have been substantiated, or cases where the employee has been disciplined or reprimanded for the misconduct in any way. That means there is a whole cache of records that might deal with very serious allegations – but that couldn’t be substantiated by investigators – the public will never see. VOSD is not pursuing records that don’t meet the legal standard for release. In one case, Oceanside Unified initially gathered sexual misconduct records for release but later determined the claims involved had not been substantiated. After learning the records had been misidentified for public release, Voice of San Diego abandoned the legal effort to obtain those records. In the teacher cases still pending, the school districts reprimanded or negotiated departures for the teachers after investigations determined sexual misbehavior claims were credible. When schools do provide employee misconduct records, student names and identifying information is withheld. VOSD is not asking schools for student names. Exactly who is paying for the teachers’ privacy fights isn’t totally clear. Members of the California Teachers Association receive legal services in employment matters “to assure that their contractual, statutory, and constitutional rights are protected” and may receive legal defense costs for some civil or criminal cases. Claudia Briggs, spokeswoman for the California Teachers Association, declined to say whether CTA was funding educator reverse-CPRA cases locally and elsewhere, but said in a general statement CTA supports the efforts. San Diego attorney Jon Vanderpool often represents local teacher unions, and is representing several educators fighting to keep their records secret. In some ways, reverse-CPRA cases turn the system on its head and put school districts – which themselves often fight against disclosing records – in the position of arguing for transparency and records release. How good a job they do varies. That VOSD’s records “request sparked so many legal challenges is troubling itself and really exemplifies the fight it takes to get public records and particularly when you have individuals who are trying to usurp the agency’s ability to release public records, which is its legal duty to do. … It throws a wrench into the whole system of how public records are to be disclosed,” Moore said. Ultimately, “when someone works for a public agency, they need to know their privacy is less,” Moore said. Moore also sees a broader effort being made in reverse-CPRA cases. In the cases spurred by VOSD’s request, the San Marcos and Vista school districts have become transparency advocates in court. Other districts, like the La Mesa-Spring Valley School District, didn’t even wait for an employee challenge to fight VOSD’s request. An attorney for La Mesa-Spring Valley schools told VOSD releasing employee names on the substantiated sexual misconduct records would invade their privacy, unless we provide the employee names desired. It’s a Catch 22: The district won’t release employee names unless VOSD asks for the names directly. But without the district disclosing the names to begin with, we don’t know which employees were found responsible for sexual misconduct or whether they are still employed in the district or elsewhere. The region’s largest public school system, San Diego Unified School District, has yet to produce a single record.